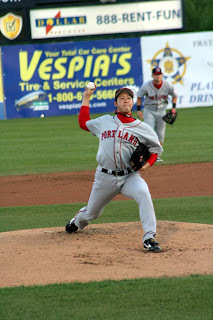 RHP Junichi Tazawa (4-2) allowed one unearned run over 6 IP and DH Jon Still (1-for-4) had 3 RBI, aiding the Portland Sea Dogs (16-14) in a 6-1 win over the Trenton Thunder (14-15) on Tuesday night at Waterfront Park. The Sea Dogs had 19 baserunners, including 10 walks and look for their first series sweep on Wednesday. Tazawa earned his third straight win (all on the road), scattering three hits, and one walk and tied a professional-high with seven strikeouts. Trenton scored an unearned run off Tazawa in the sixth inning on an error by 1B Lars Anderson. The Japanese native was hitless through the first three innings and picked up four strikeouts in his final 2 IP. Trenton starter RHP Alan Horne (0-2) left the game in the fourth inning due to injury and suffered the loss for the Thunder. Horne, who was the 2007 Eastern League Pitcher-of-the-Year, yielded six hits and four runs over 3+ IP. Portland’s trio of RHP Blake Maxwell, RHP Chris Province and RHP T.J. Large each worked scoreless frames to wrap up the ‘Dogs second straight win in Trenton. RF Reid Engel (3-for-5, RBI) gave Portland an early lead with a two-out, solo-homer over the right-field wall. In the third inning, Still’s line drive fell past the dive of right-fielder James Cooper, allowing three to score and give Still his first Double-A triple. The Sea Dogs added a run in the fifth inning on a wild pitch and their final run came on 3B Jorge Jimenez’s (2-for-4, RBI) RBI infield single. The Sea Dogs had a runner in all nine innings have 36 during the first two games. Trenton had 2 of their 3 hits during the third inning. Portland looks for a 3-game sweep of the Thunder on Wednesday night at Waterfront Park beginning at 7:05 PM. Catch all the action on the U.S. Cellular Sea Dogs Radio Network beginning at 6:35 PM with the CorrectDeck Pre-Game Show. Tickets for Sea Dogs Baseball can be purchased at www.seadogs.com or by calling (207) 879-9500. Notes…LF Aaron Bates (1-for-4, BB) has reached base safely in 21 straight games – the longest active streak in the Eastern League this season…SS Argenis Diaz had his hitting streak snapped at 10 games…Anderson went 0-for-2 with 3 walks.